Today, we’ve got another story digest for you! 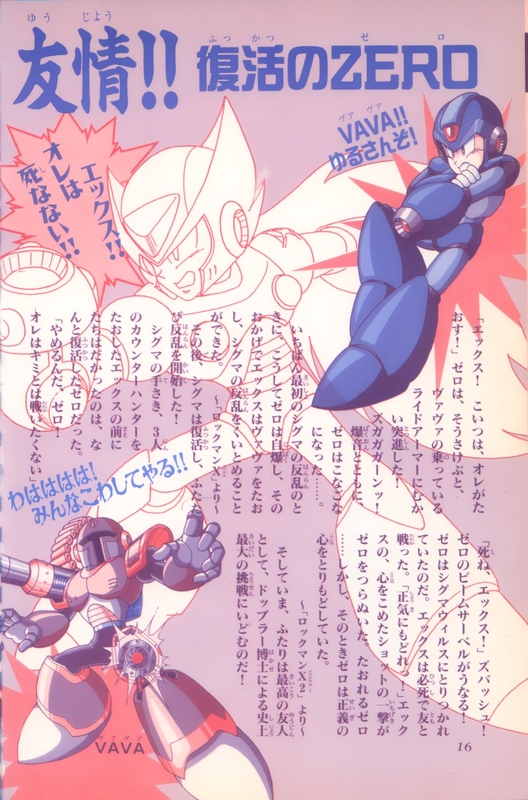 This time from the Rockman X Ultra Encyclopedia, the sequel volume to the Rockman & Rockman X Big Encyclopedia of Secrets, where we pulled yesterday’s Rockman X Confidential Chronicles from. It roughly picks up where that one left off, and also features a rarely seen uncolored art piece of Zero in his X1 form (that is unfortunately obscured by text and other clip art). Translation ahead! 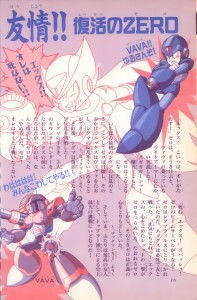 In the time of Sigma’s first rebellion, it was thanks to Zero’s self-sacrifice that X was able to defeat VAVA and put an end to Sigma’s revolt. Afterward, Sigma was resurrected, commencing yet another rebellion! X defeated Sigma’s agents, the 3 Counter Hunters, then suddenly standing in his way appeared none other than Zero, who had somehow been restored. “Die, X!” ZZZ-FWOOOSH! The crackling hum of Zero’s beam sabre cut through the air! Zero was being possessed by the Sigma Virus. X was locked in a deadly struggle with his friend. “Come back to who you really are!” X poured his entire soul into one shot that penetrated right through Zero. Zero collapsed…… But then was returned to his former heroic self. And now, these two greatest of friends will join forces to face off against Dr. Doppler in the most heated battle in history! X: VAVA!! I’ll never forgive you! VAVA: Wa ha ha ha ha! I’ll demolish everyone!! Zero: X!! I’ll never die!! Zero, how right you are. This story seems to follow the scenario where X doesn’t get all the parts, and so must fight his best friend. Some consider that to be the bad ending, since it marks a failure on X’s part. Bad as it may be, it’s certainly the outcome I got on my first play-through! When I finally figured out that getting all 3 of Zero’s parts meant you didn’t have to battle him, I was amazed but a little disappointed at how much shorter and easier the final stage became! Cool as it was to watch Zero rush in and destroy his evil clone, there was just something totally epic back then about X being forced to fight Zero and trying to save him from Sigma’s influence. It also makes the X-Hunters seem a little more sinister, and less like cartoon villains who bungled everything by letting X get all of Zero’s parts. When I go back and replay X2, I usually let one X-Hunter escape just so I can fight Zero and bring him back from the dark side. 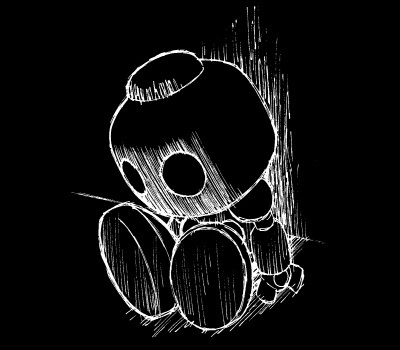 9 Comments to "The “Death” and Return of Zero (X1-X2)"
Had somehow been restored. Nice and vague! …which completely confused me when I got there, because I had gotten all the pieces, and thus had a completely different experience! Once I pried the information that he didn’t get all the parts from him and figured out it was an all-or-nothing deal, it all made sense. Nonetheless, having a completely separate experience at the time was one of my most memorable gaming moments, ever. Even though Mega Man titles always had that element of choosing your own path through the game, it never had as much impact on the story or which bosses you would face before X2 came along. That is pretty amazing! Sounds like how things turned out when I first played X5. No one really knew at first that there were multiple endings, depending on which character you started with and if you managed to destroy the colony. Me: Hey, how do you get that SubTank in Dark Dizzy’s stage? Him: Just use Zero’s double jump to get there. Me: But I don’t have Zero anymore, he’s gone maverick. Him: What do you mean, I can still select Zero. It took a few days before we managed to clear that up! I love how it says the shot penetrated Zero, but suddenly he is back to his normal self, without a huge charge shot hole in his body. Good point Flame. That’s how it read to me, but it does sound totally odd. Maybe it’s just the “soul” power that penetrated? Reminds me of X5, even though they didn’t have soul body yet. Shot through the heart with the power of love, there’s a big hair rock ballad in there somewhere.